Telstra Corporation ((TLS)) is a telecommunications and information services company providing services for domestic and international customers. It is Australia's most prominent telecommunications company with brand recognition across all segments of the industry. On January 21st 2014 it acquired O2 Networks, a developer of data networking and network security software. In May 2014, the Company completed the sale of its Hong Kong based mobiles business CSL to HKT Limited. In July 2014, Telstra acquired an undisclosed minority stake in Telesign Corp. For the six months ended 31 December 2016 revenues decreased 4% to A$12.81B. Net income before extraordinary items decreased 10% to A$1.79B. Revenues highlight the Telstra retail section decrease of 6% to A$8.14B and the Global enterprise and services (GES) section decrease of 5% to A$2.96B. The dividend yield is currently 7.0%. Broker/Analyst consensus is “Sell”. → Recent results below consensus. → 15% fall in wireless broadband revenue. → Solid competition across mobile, fixed line, data & IP markets. → Dividend under threat moving forward. → The NBN earnings gap could affect future dividends. → EPS could fall significantly over the coming years. → A zone of support has been breached. It’s been one bad news event and announcement after another for Telstra over the past few months with sentiment taking a serious turn for the worse. However, recent news that the ACCC isn’t proposing to mandate domestic mobile roaming has turned the tide on the news front with price responding positively. It is worth reiterating that we believe the technical picture is much more significant than fundamental analysis although there is nothing wrong with combining the two. 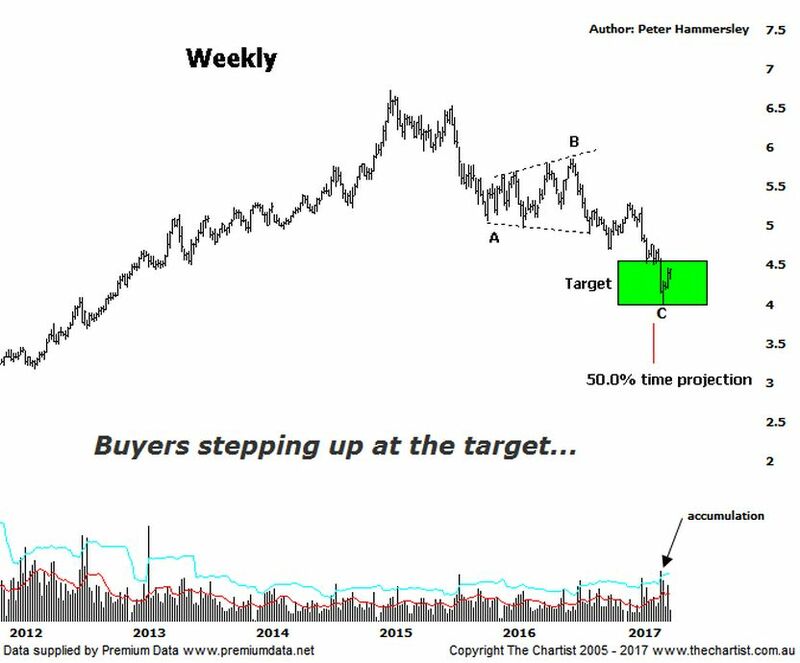 As with many companies we’ve reviewed recently, the better patterns here are evident on the weekly chart which is still our focus of attention. We had our lower target zone in position last time and noted the necessity to see buyers return before the lower boundary was penetrated. This has been the way forward with buyers stepping up to the plate at the lower end of the target area. Not that we’re suggesting a strong multi-month impulsive trend higher is going to unfold, but it could well be that a significant low is now locked in. We also highlighted the 50% time projection last time and although it wasn’t a direct hit, price has reversed within three or four bars of the cycle which is certainly close enough on this timeframe. What we are left with now is an extremely strong impulsive movement higher that commenced in late 2010 to the high made in February 2015. A corrective pattern down has followed in almost textbook fashion, which from an Elliott Wave point of view is ideal. In fact, it doesn’t get too much better. Nothing is guaranteed of course, but the most textbook the patterns become, the more likely they are to continue to unfold as anticipated. As an absolute minimum, we’d expect a reasonable bounce from here though we’ll take one step at a time and perhaps look at the daily chart next month. “…There is a strong case for taking profits right here and now although we are going to hold on to our short position and see what transpires over the coming days…” It didn’t take us long to close out our short position with the end result being a good profit. There is a case for seeing a much more substantial bounce although we’ll need a little more confirmation as well as a lower risk entry before getting involved to the long side. Much is going to depend on whether dividend payments are going to be sustained though this still seems unlikely which is likely going to affect sentiment. We’ll keep it on the watchlist though some patience is likely going to be required.